Photo credit: ITV Television & The Sun Newspaper, U.K.
I’ve always been… somewhat different, different in dress, different in style, different in outlook and perception – it came to me at a very early age that it was the ONLY way to be. Because of that certain things were, and probably are, bound to happen – and certain things will get to me. 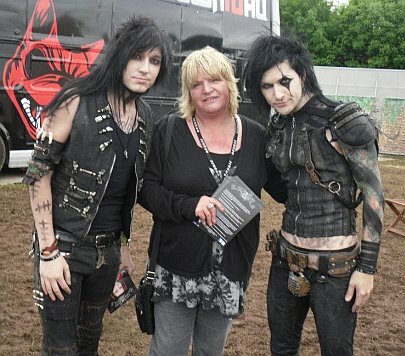 “Alternative Subculture means a discernible group that is characterized by a strong sense of collective identity and a set of group-specific values and tastes that typically centre on distinctive style/clothing, make- up, body art and music preferences. 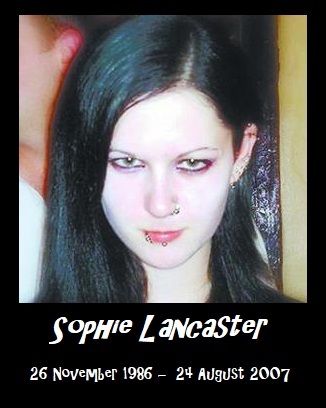 In 2007 Sophie Lancaster and her boyfriend, Robert Maltby, were attacked by a group of young men while walking through Stubbylee Park in Bacup, Rossendale, Lancashire in England. As a result of head injuries Sophie sustained in the attack, she lapsed into a coma from which she never awoke. She died of her injuries thirteen days later. Rob, also severely beaten, lapsed into a coma but he was fortunate in that he regained consciousness. The attackers set upon Robe initially but then turned their attention on Sophie when she tried to intervene and help her boyfriend. I am quite sure that many of us, moving in the circles we have, and do, can recount tales of innocents being brutalised for simply ‘being different’ – I can. It is this sort of heinous and barbaric behaviour that we must ALWAYS seek to thwart, to fight and to eliminate. Sunday the 18th (U.K. Time) was the 10th anniversary of this tragedy, we should all take pause and reaffirm our resolve to stand up, stand out and be counted in memory of Sophie, Rob and all the others who have been victimised for being different. Like I said, some things REALLY get me…! Copyright TB & RVL 2017 except where noted. This entry was posted in Crossroads Editorials, RVL Links, Uncategorized and tagged being different, Goths, Robert Maltby, Sophie Lancaster by Editor. Bookmark the permalink.